Woodland Heritage is a leading forestry charity. They are strong supporters of CCFG and offer bursaries to members of our group who wish to attend events both at home and overseas. 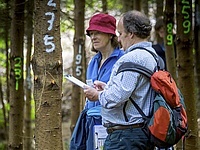 Students and young foresters, in particular, are encouraged to apply for support, but there are no age or other limitations. Each application is judged on its own merit. Preference is given to those engaged in forestry and interested in the production of high quality timber. Woodland Heritage generally requests that recipients produce a report for the Woodland Heritage Journal and/or the CCFG Newsletter.